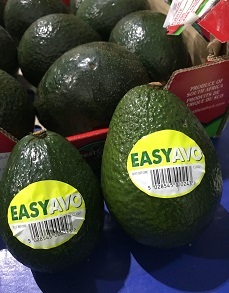 For a single week, due to limited volumes, Westfalia’s EasyAvo is available at UK supermarket Tesco, sold as a ripe-and-ready avocado in its first commercial season. The greenskin avocado with its thicker, corkier skin went on sale late last week and for this period, at least, the risk of ‘avocado hand’ will be lessened among the British population. The EasyAvo’s skin separates more easily from the flesh than a Fuerte or Hass. Consequently, it is easier to get to the flesh out of the open fruit without further cutting which will, hopefully, lead to lower incidences of consumers accidentally injuring their hands. The cultivar selection of the EasyAvo avocado is still in the development process. “It is a standalone cultivar with specific genetic characteristics that allow the fruit pulp to be removed easily from the corky skin, and these characteristics are not merely related to the moisture content of the avocados,” says Westfalia. EasyAvo is exclusively available from Westfalia Fruit. The largest test plantings of the EasyAvo are currently in South Africa but Westfalia is expanding the testing of the selection worldwide. According to Westfalia, the initial press and social media reaction has been very positive. Customers have responded very well to both the flavour and eating quality. In the UK media, unofficial videos have been posted of kitchen experiments with the EasyAvo, concluding that the avocado is, indeed, easier to peel than other avocados.